At Living Water Aeration, we bring high quality manufacturing together with affordable prices! Our aerator pump PA10W quickly boosts oxygen levels and can even be used as a de-icer in the wintertime. Heavy duty compressor: With a 1/20 horse power compressor, the AirPro Diaphragm Compressor Pomp (or PA10W aerator) is made for continuous operation. You can run it 24 hours a day for four to five years. Made of durable, long-lasting materials, you'll be able to rely on our pond aerators through virtually any season and weather condition! Enhanced benefits: This aeration system will be a great benefit to the aquatic ecosystem into which you are installing it. 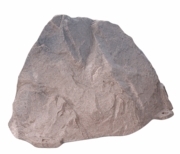 It is ideal for aeration of ponds that are both small (up to 1/16 acre) and shallow (30'maximum depth). See the chart below to see if this aerator would be right for your pond size and depth. 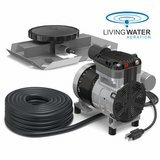 Incredible reliable power: Its small motor is energy sufficient for it will draw as little as 1.5 amps of electricity, and still be of great efficiency for your pond since it can pump up to .7 CFM (Cubic Foot per Minute) of oxygen into the water maintaining in the meantime a continuous circulation of air and water. 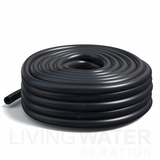 Easy to install and completely safe: The compressor comes with 50 feet of 3/8" weighted tubing, making it easier to install: The tubing will sink by itself to the bottom of the pond without the need of any additional weight making it invisible to the eye. It will also decrease the chances of the airline being snagged by fishing lines or swimmers. 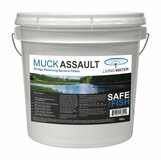 Because there is no electricity in the pond, installing this diffused aeration system is completely safe for people or wildlife near and in the water. And more... In addition, the air diffusers include a check valve to prevent water from going back into the airline, and an underlay to prevent the diffuser from settling into mud and/or muck on the bottom of the pond. 3/8'' weighted tubing - 50 ft. The only maintenance needed being the replacement of diaphragms when needed. Repair kits are available on our website (click here for more information) at a very affordable price (a noticeable and sudden drop in air bubbles after a few years of operation is a sure sign that the diaphragms need to be replaced). Installation Instructions are available in our brochure. Click here to access a PDF downloadable version. This type of compressor needs to be protected against weather (rain, snow or other elements...) for it can cause irreversible damages. 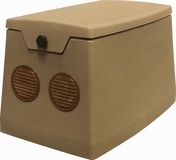 It is essential that you provide a shelter to protect your compressor (a waterproof cabinet either made of steel or of polyethylene- see under Cabinets for more information). We highly recommend this aerator for hatchery ponds and smaller fish ponds. We have a pond and need a aerator for the fish. Would this system work if the water is muddy? The soil is clay. my pond is 150x150 8 feet deep is this the right size compressor for me? Are pond is 150 feet by 150 and 8 feet deep would this Aerator be big enough? I have a 60 X 60 ft pond. Looks like 1/15 acre? Max depth 6-7 ft. Seems like this is the system for me. Is there a downside to getting a system that pushes more CFM than this? Can is be oxygenated too much? No in fact it would just be more beneficial to have more CFM, there would be no downside at all. I have a pond with a surface area of 35X60 and 9' deep at it's deepest (for an area of approx 25x30) with the rest being about 2' deep. My calculations showing this one should do the trick - my pond being not too much smaller than it's recommended size. I just want to verify - it this the right sized pump? Also - our water is clear and we can see the pond bottom - are the white arms the part that sit at the bottom of the pond? Any chance those come in black? Lastly - can I use an extension hose if I need to go longer than 50' to get from the pump house to the bottom of the pond - can I use an extension hose? Yes this would be the right size unit for your pond and yes you can increase the airline. We actually do have these diffusers in a darker color also. Will this take care of a clean 1/2 acre pond ? I would need more information I would need to know the surface area of your pond. This could potentially work in a pond of that depth so long as it was no bigger than 1/20 of an acre in surface area. This unit is designed to aerate a small pond.